A road less traveled. The only location I left out was my 4 years in Ohio for college. With the exception of Ohio, which wasn’t 100% my choice since my parents had to agree to foot the bill, I didn’t have a choice with the geographical moves above. But what an unusual path I have since chosen. Alaska to Washington, DC to Chappaqua, NY (made famous by me, I mean by Bill and Hillary Clinton) to Ossining NY. To my destiny, my passion. To being an English teacher. To Kichwa. Ñukaka inglesmanta shimita yachachini. 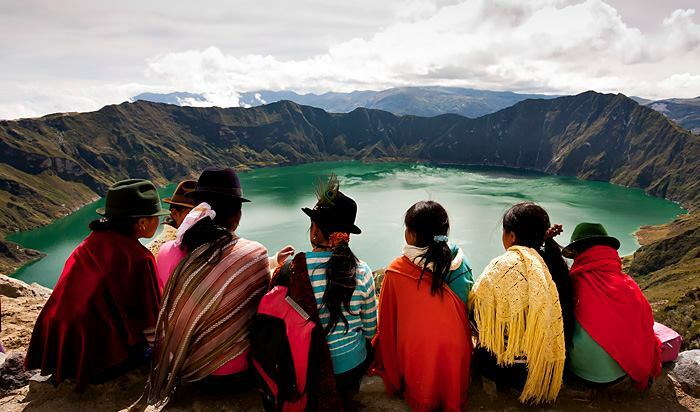 Kichwa is a language, it’s a people, it’s a culture, it’s a philosophy, it’s a way of life. It’s fascinating. It has become a part of me. Kichwa, on the UNESCO endangered language list. Kichwa, one of the two official languages of Ecuador. Kichwa, spoken by 90,000 in Cañar y Azuay in Ecuador. Kichwa, spoken by many others in the highlands and lowlands of Ecuador. Kichwa, spoken by 10,000 people or so in the New York City area (guesstimate based mainly on parish records…I think). 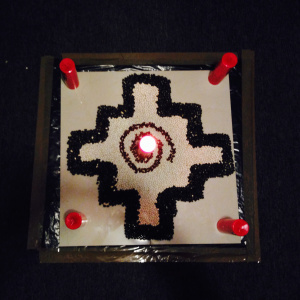 Kichwa, spoken by many families and many students in Ossining, NY. Kichwa, spoken by many students in my classroom. I can’t show any of my students’ pictures here, but they have gone from traditional dress, traditional ways of wearing their hair, traditional customs and festivals, and moved to New York, to Ossining. To Nike and sports caps and gelled hair and pretending that they aren’t indigenous, that they aren’t Kichwa. To a “let’s fly under the radar so we aren’t made fun of by other students” situation. Who have come from a society in their native country that has discriminated against them since Spain colonized Ecuador. And continues to do so. Yet so proud of who they are and from where they come. A paradox. A conflict. A tragedy that endangers their language and culture. I had no idea how to communicate effectively with some of these students, knew next-to-nothing about their culture or language and didn’t know where to go for help. 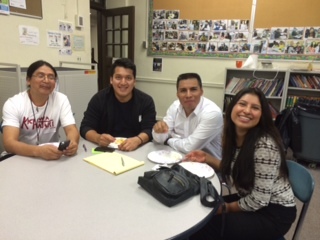 This organization, Kichwa Hatari NY, is dedicated to keeping the Kichwa language and culture alive, reaching the community through a radio show that broadcasts on the internet, reaching Kichwa speakers world-wide, through programs and movies, and most importantly……coming to Ossining High School! And having fun. 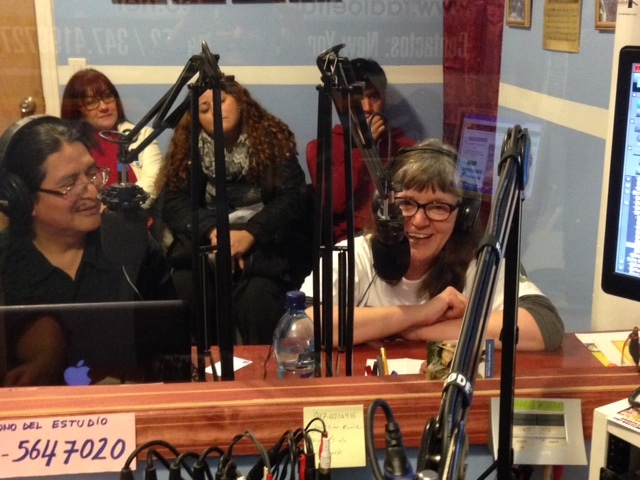 And inviting me many times as a guest on their weekly radio show with Charlie Uruchima of Kichwa Hatari NY, Fabian Muenala, poet, philosopher and professor of Kichwa, and Segundo Angamarca, Producer of Radio El Tambo Stereo. My mashikuna. After much pushing and prodding, they finally got the microphone away from me. Did I mention that we laugh a lot? I am SO fortunate to work for a school district that celebrates diversity, that encourages all families and students to feel an equal part of the school community. 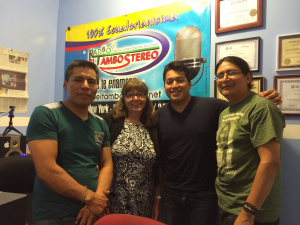 To work in a town that raises awareness with the Police Department about language and cultural issues within this segment of Ecuadorian immigrants in Ossining. To be able to teach other teachers as I learn more about the language and culture of so many of our students. 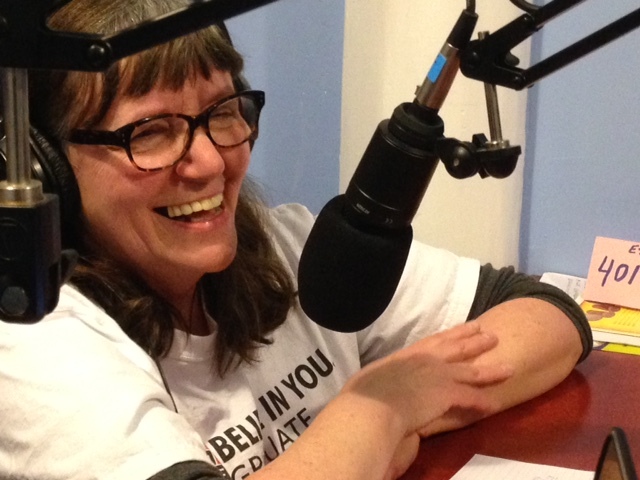 A district where the Principal gives us the idea to start a local radio station in Ossining for students and their families. Created by students, produced by students. To work with the best students that anyone could ask for and with families who teach me respect and admiration for their culture. To be invited to be a part of a United Nations conference as part of their Permanent Forum of Indigenous Issues. To go to the beat of a different drummer. To be on my path. 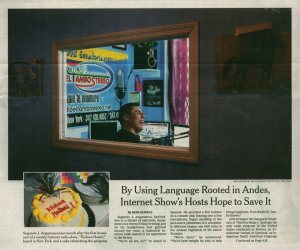 This entry was posted in education, humor, languages and tagged Chappaqua, ecuador, Elmendorf AFB, Humor, kichwa, kichwa hatari, language, New York Times, ossining, Ossining UFSD, radio el tambo stero, TEACHING. Bookmark the permalink.